Instructions: Click here to view a larger photo of this project. Using Sweet Plum ink stamp 3 small pansies. Color the centers in Buttercup ink and then the remainder in the Lavender ink. Die cut with coordinating dies. Lightly mist and shape in 3D Pansy mold. Highlight the edges with the Plumeria ink. Using Bamboo leaves ink, stamp 3 small leaves and color with the same ink and cut with coordinating dies. Lightly mist and shape in the 3D Pansy mold. Highlight the edges with the same ink. Using Smokey Gray ink, stamp ther Petite Pansy Frame twice. Color the leaves with the Bamboo ink and the flowers with the Lavender ink. Cut with coordinating dies. Highlight the frame with the Nuvo Glitter Accents and allow to dry fully. 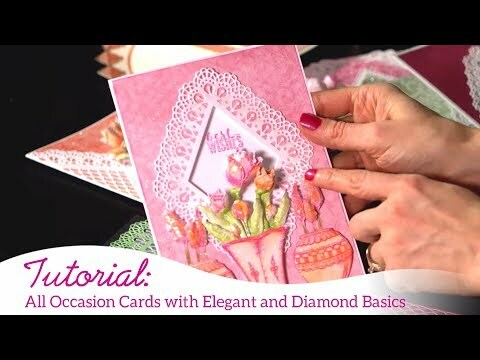 Using white cardstock cut 2 intricate die cuts with the Diamond and Lace Die set. 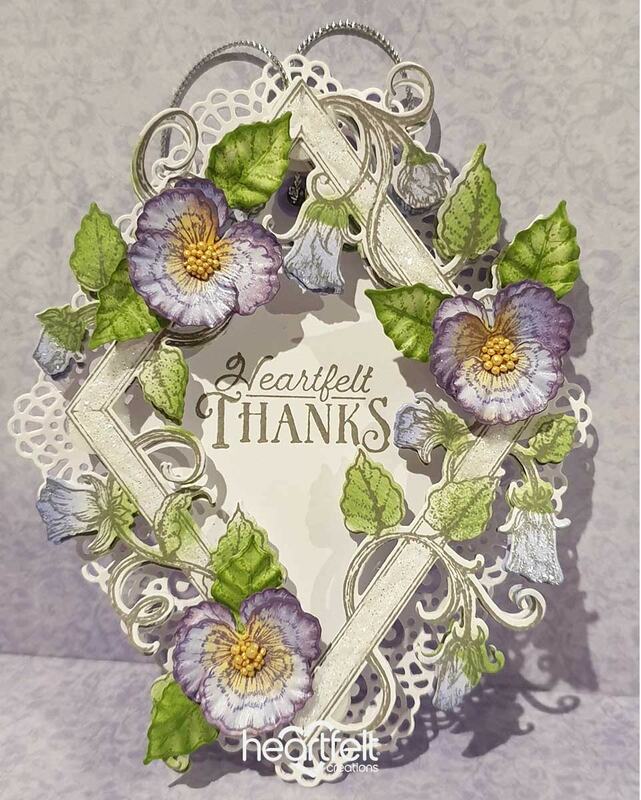 Line the Pansy frame up over your Diamonds and Lace die cut and using Smokey Gray ink, stamp your "Heartfelt Thanks' sentiment. Tag Assembly - Apply an eyelet to the top of the Diamonds and lace die cut. Tie silver twine through to create a hanger. Adhere the second Diamonds and lace die cut over the top to secure the hanger and make the overall tag stronger. Using 3d dots, adhere the first frame and using 3d dots, again adhere the second frame. Adhere the leaf first and then the pansy over the full flowers, add prills to finish.